It’s smart to know who you are about to share a ride with, so let me introduce myself. My name is Ken Condon and I’m a motorcycling junkie. For over 40 years I have been a commuter, tourer, off-road rider, track day instructor, road racer, drag racer, and plain old street rider who enjoys riding with friends and family. It’s embarrassing to admit, but I started riding as a way to enhance my adolescent manhood at a time when my skinny physique and sensitive demeanor did not exactly make me a chick magnet. It didn’t take long to realize that riding a motorcycle wasn’t going to make me any more interesting to girls. But, by then the riding bug had bitten hard and there was no turning back. As parents are known to say: “it’s all fun and games until someone gets hurt”. Well, I learned that truth after a couple of mishaps in high school brought the reality of the risks into plain view and threatened to spoil the fun. However, I was not to be deterred. I didn’t like feeling vulnerable, so I started improving my riding skill and learning strategies for survival to reduce anxiety and prevent any future pain and repair expense. This began my long journey toward being the best rider I can be. In addition to my 40 years on two wheels, I also have 20 years experience as a certified Motorcycle Safety Foundation instructor/coach, 15 years as a track day instructor, and 3 years as owner of “Riding in the Zone Motorcyclist Training” where I offer real-world, on-street and on-racetrack rider coaching. I am also author of the book “Riding in the Zone: Advanced Techniques for Skillful Motorcycling” and have written over 250 skills and safety articles for Motorcycle Consumer News (MCN). I am currently the author of the “Street Savvy” column for Motorcyclist Magazine, and creator of the “Riding in the Zone” blog. I told you I’m a motorcycling junkie. 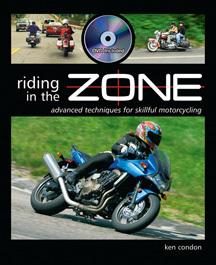 Ken Condon is author of Riding in the Zone and Motorcycling the Right Way. 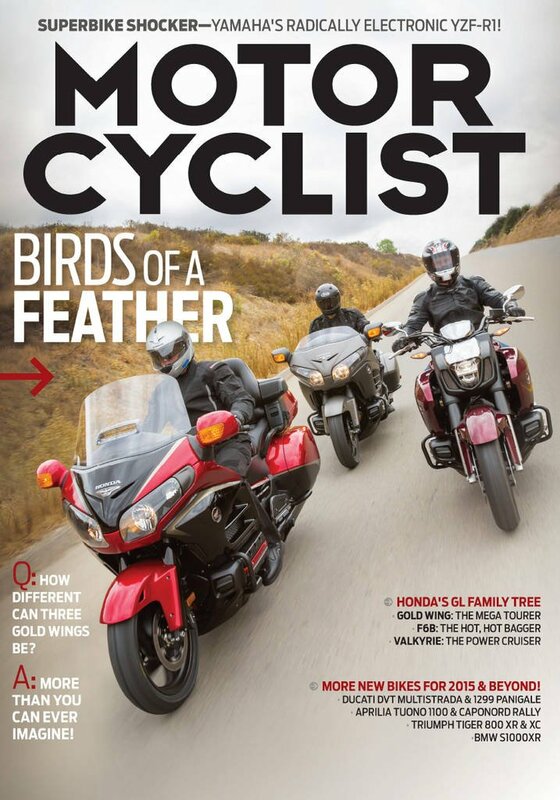 Ken’s writing can also be seen in Motorcyclist Magazine and previously in Motorcycle Consumer News. Ken is lead instructor for Tony’s Track Days and a 20-year MSF RiderCoach, veteran roadracer and avid off-road rider. Ken is also a public speaker and dedicated advocate of motorcycle safety. He helps beginner, intermediate, and advanced motorcycle riders develop the physical and mental skills to ride with more confidence, both on the street and on the racetrack. Ken is an experienced off-road rider and championship-winning roadracer since 1986. This experience has given Ken the ability to compete at a high level and share the tricks and tips to other motorcycle racers. When not helping others become better, safer riders, coaching amateur roadracers, or writing books and articles, Ken is exploring beautiful roads and trails throughout the Northeastern U.S. with his wonderful wife Caroline and daughter Jeannine. 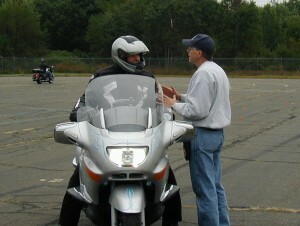 Ken gives direction to a BMW rider at an MSF Experienced RiderCourse. With more than three decades of motorcycle riding experience, including road racing, touring, dirt riding, and commuting Ken has learned what it takes to become a skillful, confident rider. Ken has been helping street riders become safer and more proficient as a 20-year Motorcycle Safety Foundation RiderCoach and is the owner and lead instructor of Riding in the Zone Personal On-Street Training Program. During the past fifteen years Ken has been the lead instructor for Tony’s Track Days where he develops the training curriculum, trains track day instructors and control riders and runs the Track Day Training Program. 2014 to present- Motorcyclist Magazine author of the monthly Street Savvy column. 1976 to present- Commuting, Touring, Sport Touring, Sport Riding, Road Racing, Off-road riding. Racing a Kawasaki Ninja 500 with the USCRA club at New Hampshire Motor Speedway, 2014. Yes, Ken won the race. Ken is a championship-winning roadracer who started in 1986 with AAMRR and returned in 2000 to race with the Loudon Road Racing Series. Ken began racing with the USCRA vintage road racing club in 2014. See the photo gallery for a pictorial history of Ken’s racing career. 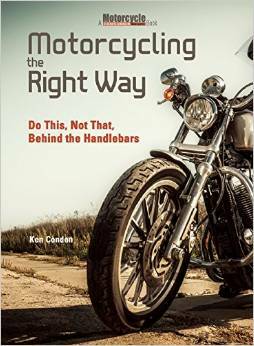 Ken is the author of “Riding in the Zone” and Motorcycling the Right Way. In addition to being the author of “Riding in the Zone” and Motorcycling the Right Way, Ken writes the monthly “Street Savvy” column for Motorcyclist Magazine. Read all of Ken’s columns HERE. Ken has also written the monthly “Proficient Motorcycling” and “Street Strategy” columns for Motorcycle Consumer News for over 10 years. Contact me if you’d like me to speak at your event or with any questions. See this blog post about the 2013 Condon Family Blue Ridge Parkway trip. I`m very interested in learning as much as I can to help others to be more safe.